At 4.8%, the average dividend yield on UK stocks is back at levels not seen since the global financial crisis, according to Link Asset Services. However, if you’re investing for the long-term, a sound approach is to focus on companies with the capacity to keep on growing their dividend year-after-year rather than obsessing over the initial yield. By reinvesting this flow of dividends back into the company’s stock you can potentially achieve eye-catching growth in your investment pot. Research suggests that firms delivering material dividend growth outperform the wider market, offering the prospect of strong capital returns alongside increases in the payout. According to a study by US firm Ned Davis Research, companies which grew or initiated a dividend experienced the highest returns relative to other stocks on the flagship S&P 500 index between 1972 and 2018. Ultimately the ability to consistently grow a dividend implies a company is cash generative and shareholder-friendly. In this article we have identified a list of UK stocks with the highest levels of annualised growth in the dividend over the last decade and back-tested these dividends to check they have not been cut at any point through that period. 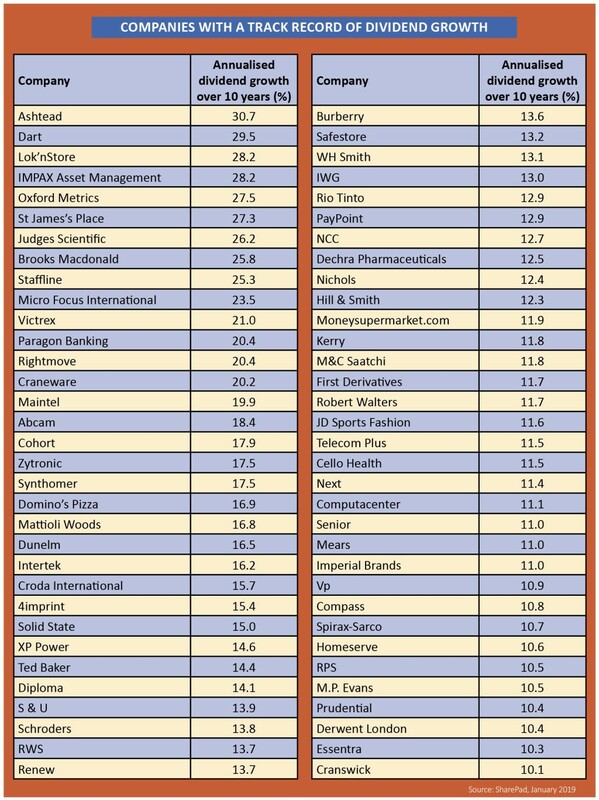 Not all the names in the table have grown their dividends year in year out, but they have generally maintained dividends at the same level in tougher years. Using the expertise of the Shares team we have identified a select group of companies where we believe the dividends look healthy and there is sustainable growth. We’ve taken a long-term view of the prospects for each of these stocks. They are not intended as investments to deliver short-term capital gains but, instead, where you should see compounded returns from dividends over a long period. Our picks are: equipment hire business Ashtead (AHT), healthcare software specialist Craneware (CRW:AIM), quality assurance firm Intertek (ITRK) and retailer WH Smith (SMWH). We’ve also taken a look at JPMorgan Claverhouse (JCH) as an example of a really good investment trust that ties into the dividend growth theme. Why does dividend growth have such a significant impact on returns? It is all thanks to the power of compound interest. Let’s show you how it works. If you put £1,000 into an account paying 6% interest, you’ll have £1,060 after one year. Next year, you’ll be earning 6% on the £1,060 rather than just the original £1,000. That might not seem like a big deal, but the effects can really stack up over time. So how does this concept apply to dividends? A company’s dividend yield is calculated by dividing its full-year dividend per share payment by the current share price and expressing it as a percentage. In many ways this yield is similar to an interest payment – offering a return which is proportional to your holding in a company. By reinvesting your dividend and using it to buy shares in the same firm you’ll be steadily increasing your holdings of that particular stock. In turn, you’ll be setting yourself up for even more dividends down the line. Your benefits are enhanced further if the actual dividend payment is also growing each year. The chart below shows a hypothetical example with two companies. 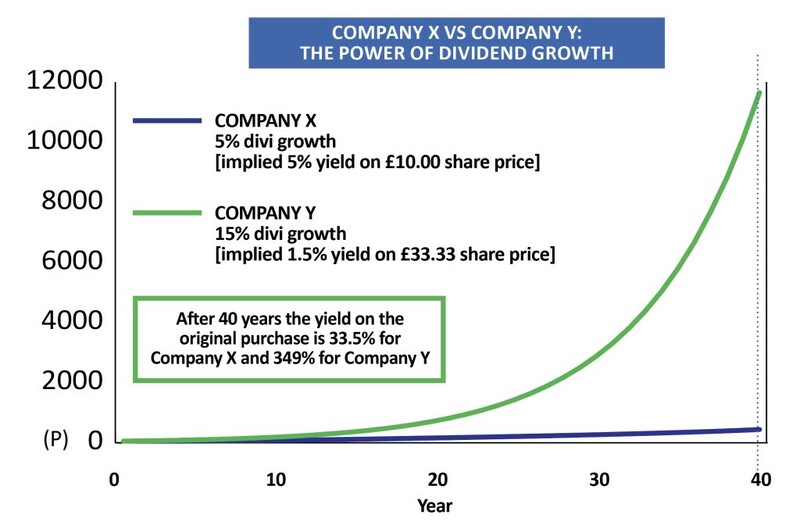 Shares in Company X trade at £10 and pay a 50p dividend for a 5% yield. Shares in Company Y trade at £33.33 and also pay a 50p dividend for a 1.5% yield. Dividends at Company X then grow at 5% per year while dividends at Company Y grow at 15%. 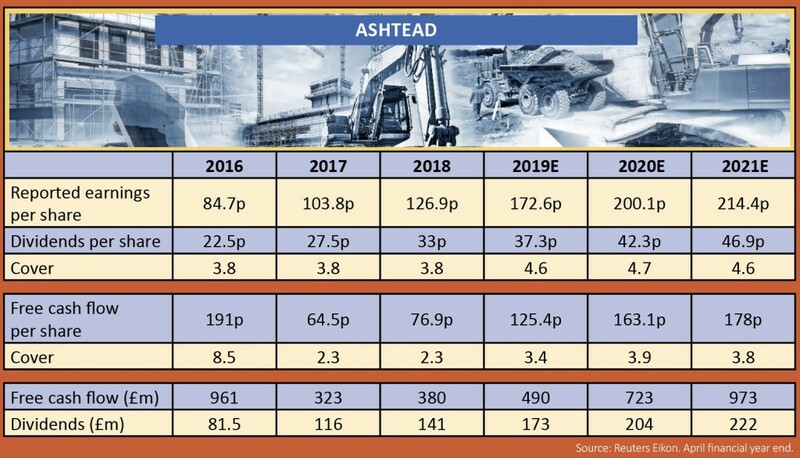 To take a real-world example, equipment hire firm Ashtead’s yield based on its most recent annual dividend of 33p and its share price 10 years ago is upwards of 70%. While the comparable figure for oil major Royal Dutch Shell (RDSB), which for the most part has kept its dividend steady over that period, is 8.7%. Shell’s yield based off the current share price is 6.2%, while Ashtead’s is 2.1%. We added Ashtead to our Great Ideas list last October at £19.67 as its shares had fallen sharply and looked cheap on the basis of its earnings growth. The shares went on to lose close to another 20% but they didn’t trigger our stop loss which was fortunate as in our view the investment case hadn’t changed and the shares are now almost back to our initial price. The company makes close to 90% of its sales renting construction equipment in the US and group rental revenues were up 19% in the first half. Despite the recent US government shutdown, its end markets of large civil works projects and non-residential building remain ‘supportive’. In fact, given the strength of demand it was experiencing the firm raised its full year guidance when it published the half year numbers in December 2018. 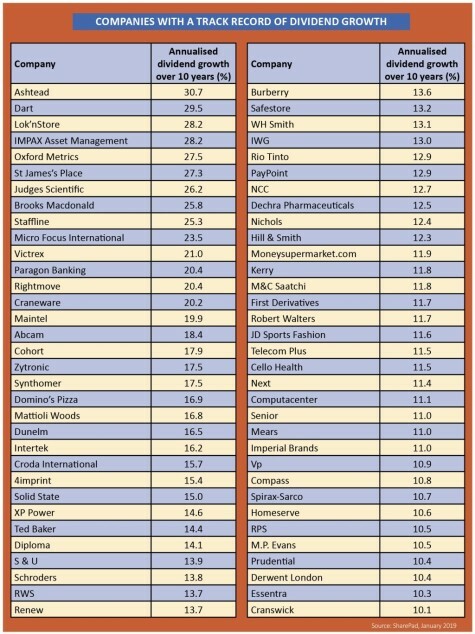 Ashtead actually tops the dividend growers’ list with a compound annual growth rate of 30.7% over 10 years. The consensus dividend forecast for the year to 30 April 2019 is 37.3p per share or a 13% increase on the previous year’s payment. 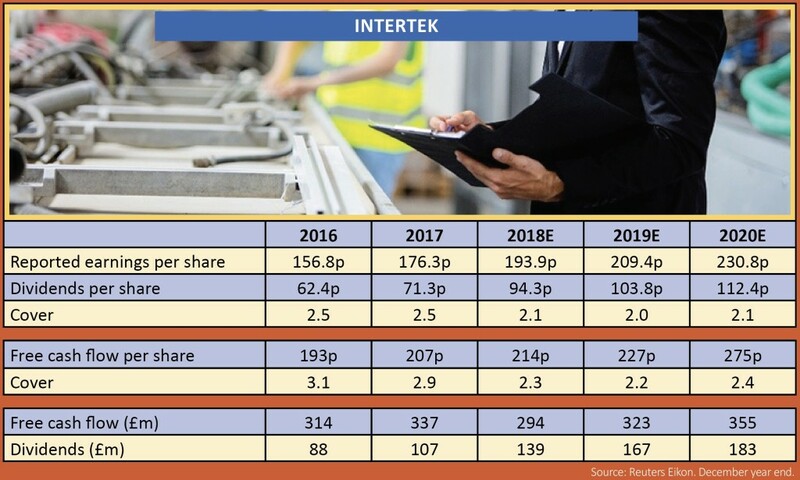 The forecast for the year to April 2020 is 42.3p per share which is another 13% advance and the forecast for April 2021 is 46.9p or an 11% increase. This means that while dividends are forecast to grow, they aren’t seen growing at the same clip as in the past. 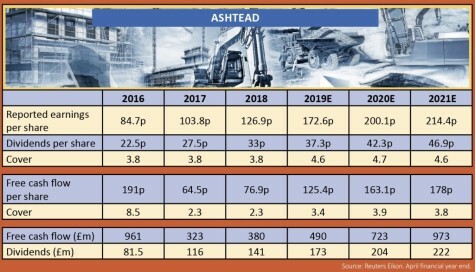 However, there is plenty of scope for Ashtead to either raise the dividend or make special one-off payments as dividends are more than covered by earnings and cash flow. As the table shows, on an earnings basis the dividend is covered roughly 4.6-times for at least the next three years. On a cash flow per share basis, dividends are covered between 3.4-times and 3.8-times which is more than ample. While Ashtead may not top the list of dividend growers 10 years from now, it should have no trouble sustaining an increased payout and looks certain to feature on the list. 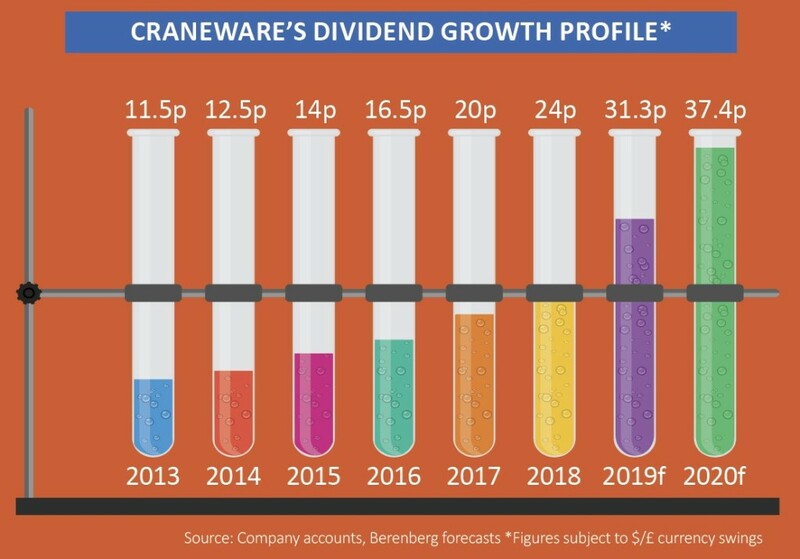 Investors might draw many conclusions as they mull over the sizeable niche market opportunity, technological expertise and operating performance of Craneware, but its track record of paying dividends is often underappreciated. The health sector financial software supplier is best known as a growth company but to dismiss its potential for escalating shareholder payouts over the coming years would be a mistake. Craneware provides technology solutions through its Chargemaster and Pricing Analyser toolkits that help hospitals and other healthcare providers more effectively price, code, charge and retain earned revenue for patient care services and supplies. That makes it one of those rarities – it directly benefits clients’ own bottom lines. That clients sign typical multi-year contracts means they are sticky while future income is visible, high margin and generating plenty of cash. Research suggests that the average 350-bed hospital misses out on $22m in revenue capture opportunities every year. This is where Craneware can help, identifying new income opportunities to healthcare management as well as highlighting operational and financial risks. It currently works with fewer than a third of US hospitals which shows the scope for growth, and that’s before even looking at markets outside the US, or new products lines, such its recently launched Trisus platform or a new analysis tool aimed at pharmacies. Mid-teens or better annual growth in revenue, profit and free cash flow underline why dividends have been rising at about 20% a year for the past five years. That trend looks likely to continue long into the future. This is masked a bit because Craneware reports in dollars, so payouts are subject to currency translation. Extrapolate 20% a year income growth into the next five years and the dividend would more than double from last year’s 24p per share payout to about 60p. 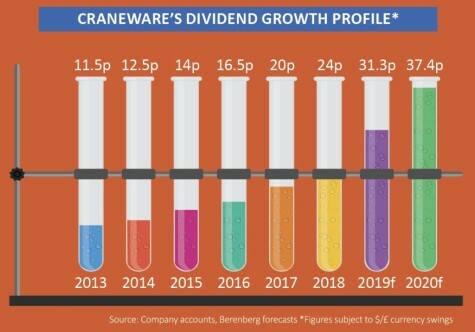 As global growth opportunities shrink as economic belts are tightened, those with growth opportunities like Craneware, even in the face of macro headwinds, will become even rarer and more in demand with investors. Intertek is one of the world’s leading testing and inspection firms with customers in consumer industries like food, clothing and toys, manufacturing industries, oil, chemicals and pharmaceuticals. It has a market value of £8bn and annual sales of nearly £3bn. There are quality standards and regulations which companies need to meet every step of the way. That includes sourcing raw materials to making the finished goods, transporting and distributing them and even selling them to consumers. With over 1,000 facilities and 43,000 employees in more than 100 countries across the world, Intertek can offer its ‘Total Quality Assurance’ solutions to customers when and where they need them. The potential market is worth $250bn a year and it continues to grow as technology evolves, as companies focus on risk management and as consumers demand higher quality products. Being a trusted partner means Intertek can grow organically by cross-selling its services, but it also makes selected bolt-on acquisitions to increase the range of solutions it can offer. Last summer the firm set itself some fairly demanding five-year targets: 20% annual growth in billings, 30% or more EBITDA (earnings before interest, tax, depreciation and amortisation) margins by 2023 and a negative working capital position, meaning that Intertek gets its customers to finance its operations. It already operates a ‘capital light’ business model and working capital is down to just 5% of revenue so this last target seems achievable without too much trouble. In its latest shareholder presentation the company committed itself to ‘sustainable shareholder returns through the payment of progressive dividends based on a target payout ratio of circa 50%’. A 50% payout ratio tallies with the consensus forecasts which show reported earnings covering dividends by a factor of two for the next few years. Importantly, dividends are also covered by free cash flow per share. UK retail stalwart WH Smith has a great dividend growth track record stretching back to its 2006 demerger (WH Smith & Smiths News). The total payout has risen from 11.8p in 2007 to 54.1p for the year to August 2018. Growth in the shareholder reward was maintained during the financial crisis and has been sustained since, even in the face of the structural changes that have roiled so many traditional brick and mortar retailers. This enviable record in growing the shareholder reward stems from WH Smith’s strong balance sheet and high cash generation. Cash is invested in the business where returns are greater than WH Smith’s cost of capital, deployed for carefully selected, earnings-enhancing acquisitions and returned to shareholders through share buybacks and a progressive dividend. 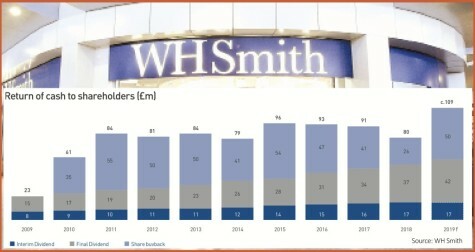 Bears will (incorrectly) argue the high street stationer, bookseller and newsagent is a business in terminal decline, but this ignores WH Smith’s vast international growth potential through its travel division, continuing to open up units in airports, railway stations, hospitals and motorway service stations. These are locations where consumers are ‘captive’; they don’t have the luxury of being able to shop around for a better price, have barely any time to browse and are highly likely to splash the cash on a book, magazine or bite to eat. The travel arm generates more than half of group sales and the lion’s share of profit. Furthermore, 2018’s £155m acquisition of US travel retailer InMotion has boosted the size of WH Smith’s travel business and further reduced the reliance on the embattled UK high street. InMotion also provides a platform from which to expand across the pond in the world’s largest travel retail market. 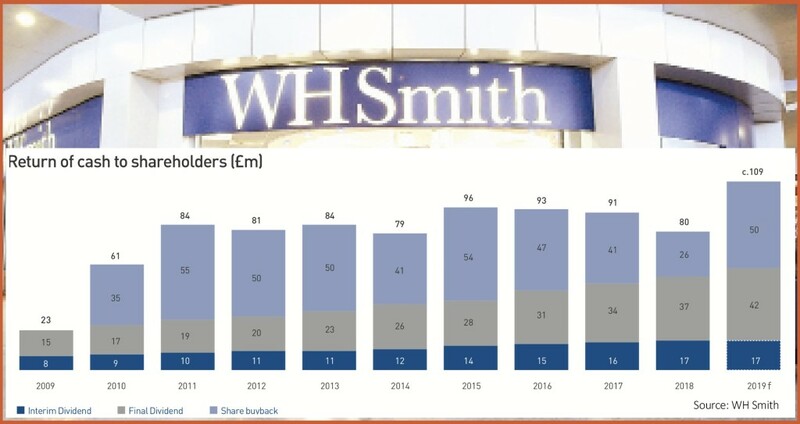 In its latest trading update, covering the 20 weeks to 19 January, WH Smith reported flat like-for-like sales, constrained by a 2% like-for-like decline in a high street division run for cash yet still seeing gross margin improvements. Encouragingly however, the performance was supported by 3% like-for-like growth in the expanding travel division which is WH Smith’s long-term growth engine. When it comes to paying and growing dividends, investment trusts have a major advantage as they can keep back up to 15% of their income each year. This is added to their revenue reserves, which they can use to smooth dividend payments from one year to the next to potentially generate a steadily increasing stream of income for their investors. Although increases in its dividend are slow and steady rather than spectacular, we think JP Morgan Claverhouse (JCH) is an excellent option for an investor wanting to take advantage of the dividend growth theme. The quarterly dividend player has, according to figures from Kepler Partners, achieved annual dividend growth of nearly 6% over the last five years and has a great longer-term track record too, increasing the dividend every year for the last 45 years. Claverhouse has a large revenue reserve with its most recent annual dividend 1.41 times covered by this cash buffer. As Kepler observes, for this reason ‘the trust offers one of the greatest margins of safety in the investment trust universe’. Managed by William Meadon and Callum Abbot, the trust is invested in a collection of well-known UK income plays including Royal Dutch Shell and Imperial Brands (IMB). Meadon describes the trust as a ‘get rich slow’ investment. Financials is the most heavily represented sector in the portfolio at 21.4% and typically the trust has upwards of 60 holdings. It has the flexibility to invest all the way from the FTSE 100 down to small cap companies. Although the trust is focused on income stocks, the constituents of the portfolio show it is prepared to look beyond the initial yield in its selection criteria. For example, growth stock Fevertree (FEVR:AIM) counts among its holdings, likely in the hope its continued expansion will support growth in the dividend, alongside healthy capital returns, despite the current yield being very modest at around 0.6%. The managers have recently been attempting to limit risks by reducing exposure to cyclical stocks and taking the gearing level down to zero. Can BP beat expectations again with results on 5 February? Should investors be worried about Tritax’s shift in strategy? Great start to the year for the markets... but can it last? 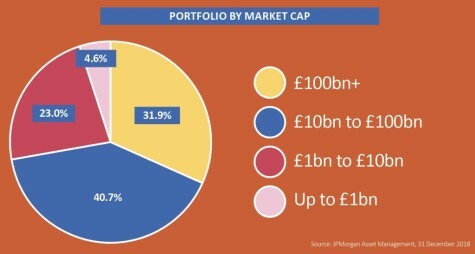 Are you really getting diversification from your funds and investment trusts?